It took almost 10 years to construct, but the InterContinental Shanghai Wonderland will soon open on December 1st offering guests a most unique hotel experience. The hotel will be located about 20 miles outside of Shanghai in a quarry at the base of Tianmen Mountain, according to INSIDER. Designed by the same architects who created Dubai’s Burj Al Arab, InterContinental Shanghai Wonderland will have 18 stories, with 16 of those stories located underground. The bottom two floors will be completely submerged underwater and face a 33-foot-deep aquarium. According to CNN, the underwater portion of the hotel will have a restaurant, pool, and water sports center. The property is taking advantage of every aspect of the quarry. 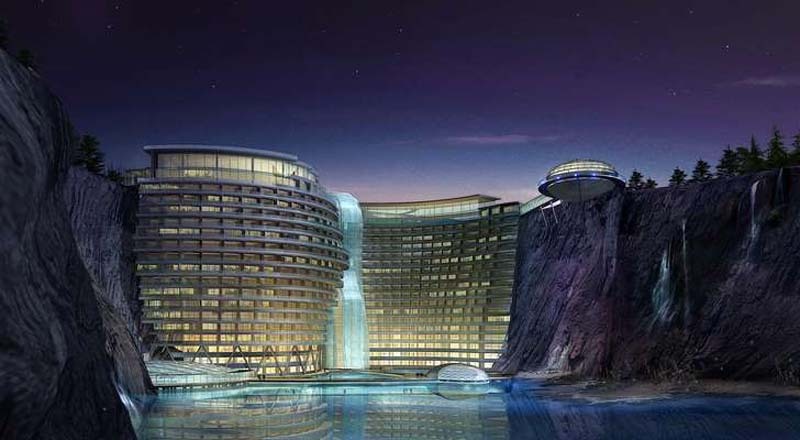 For instance, some hotel rooms will face an adjacent waterfall which will create a lovely view with scenic cliffs and hills of the Tianmen Mountain National Park. There will also be rock climbing and bungee jumping available. The hotel was constructed to reduce the impact on the environment and will be able to generate its own geothermal and solar power, as well as feature a green rooftop that disappears into the surrounding landscape. Travelers can begin booking rooms on November 20th at approximately $487 per night.